Why do you claim ceramic PCB in AluminaOxide (Al2O3) has a good thermal conductivity compared metal core PCB (IMS) when you know Al (160 W/mK) and Cu (>200 W/mK) have a much higher thermal conductivity compared to Al2O3 (22 W/mK)? Alumina 96% (Al2O3), on the other hand, is a dielectric material and thus traces can be placed directly onto the board eliminating any loss in conductivity. Additionally, DK Thermal is using Copper (Cu–396 W/mK) as well as Silver (Ag–400 W/mK) metallization allowing the heat to spread even better over a large ceramic surface away from the sensitive component. Can ceramic PCBs pass reflow and be used in SMT & pick-and-place machines? Can ceramic PCB be multi-layer? How big can ceramic PCB be? Our maximum standard size is 125mmx125mm or 5″x 5″panels. Upon request, we can accommodate boards up to 180mm x 180mm (7″x 7″) or even larger. Is there also a solder mask layer, surface finish and silkscreen possible? Yes. The possibilities depend on the manufacturing process. Solder mask similar to other PCB can be applied in most cases, however, we do also offer a glass for high-temperature solutions which can be transparent or black. Surface finish has a similar reasoning, however, for high-temperature applications, we offer only silver and gold plating. Last but not least, applying silkscreen is no issue. What is the difference between Thick film ceramics and LTCC? Thick film ceramic boards are post fired which means vias, traces, stacking, etc…are only done after the board has been ‘baked’ already and is in its sturdy and hard form. On the other hand, LTCC or Low Temperature Co-fired Ceramics are still in a relatively soft state when cavities, vias & holes are punched and traces are printed. This way, it is still possible to smooth & round inclinations so multi-shape and angled designs are possible. Only after this process, the board will be co-fired at a temperature of 900°C. 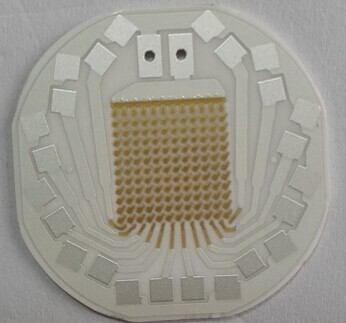 If there is any question about Ceramic PCB you want to know which is not showed on this articles, please feel free to contact us at info@hitechpcb.com.